Even for special occasions, I would rather look to nature to provide wholesome tints to the desserts I make for my family. 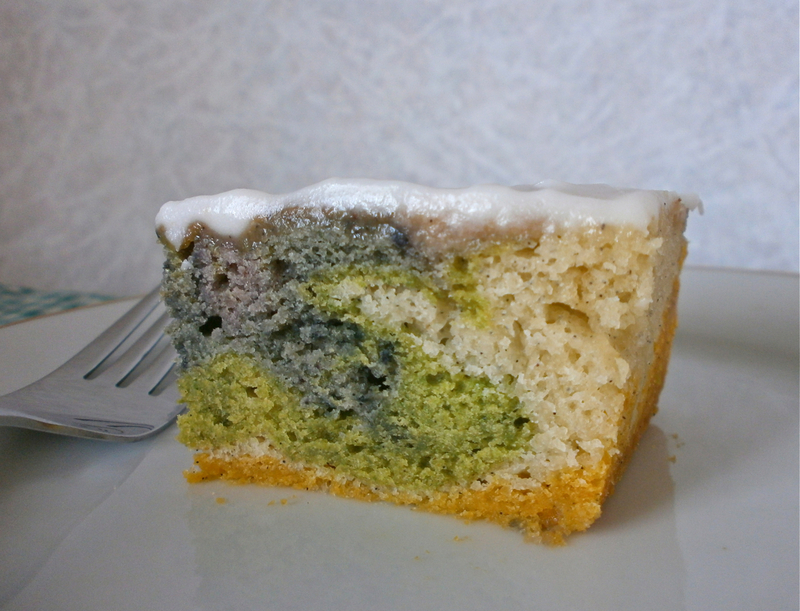 For a simple way to create a multicolored cake, I decided to employ my blender and swirl the colors rather than bake separate layers. What resulted was a lovely cake and fewer pans to wash. I hope you’ll enjoy this simplified, more natural approach to making a rainbow cake in just one pan. 1. Mix together melted butter, milk, and eggs. Add cake mix and ginger; whisk together until combined well. Preheat oven to 350 degrees F (180 C). 2. Scoop out 1/2 cup batter and whisk in mixed berry or beet juice to tint the batter pink. Pour batter into a greased 8 by 8-inch square baking dish or pan. 3. Transfer another 1/2 cup plain batter to blender and add cooked carrots. Puree carrots with batter until a smooth orange color is achieved. Pour orange batter into baking dish. 4. Pour 1/2 cup plain batter over orange batter layer. Transfer another 1/2 cup plain batter to blender and add spinach leaves. Puree until batter is smooth and green. Pour green batter into baking dish. 5. Transfer 1/2 cup plain batter into blender and add blueberries. Puree until batter is smooth and tinted blue. Pour blue batter into baking dish. 6. Transfer 1/2 cup plain batter into blender and add blackberries. Puree until batter is smooth and tinted purple. 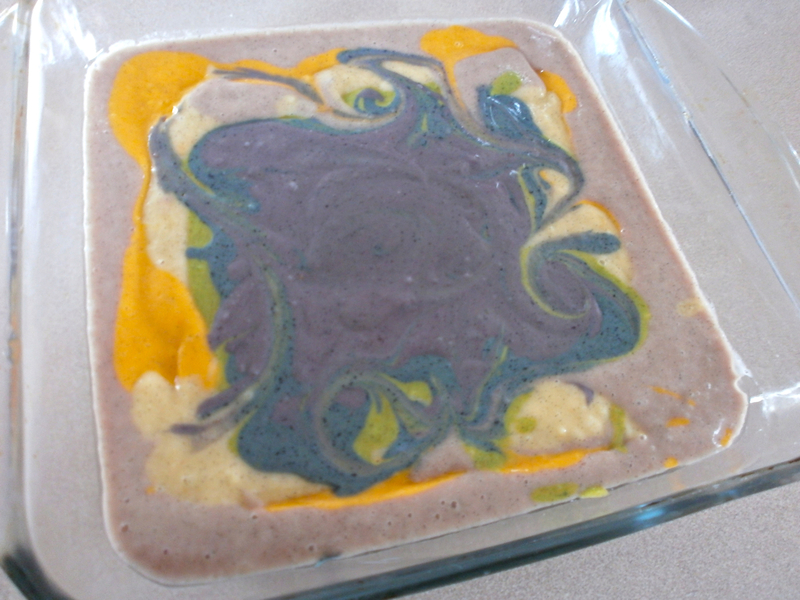 Pour purple batter into baking dish. 7. Swirl colored batter briefly with a butter knife. Bake at 350 degrees F (180 C) until cake tests done, about 40 minutes. 8. Allow cake to cool completely before frosting. I made a simple whipped frosting from chilled coconut cream, powdered sugar to taste, and a couple of drops of pure vanilla extract. Next time I would like to try using beet juice for the pink tint; the berry juice concentrate that I had on hand did not show up that well after baking. Find more healthy recipes at Pennywise Platter this week. I agree. Why resort to chemicals when you can find beautiful, edible colors in fruits and vegetables? Thanks for visiting me here at my new blog. I bet the flavor is so much better with the natural berries to color the cake. I love this idea. I pinned it. Thanks for linking up to Saturday Dishes Cakes & Party Ideas blog hop. 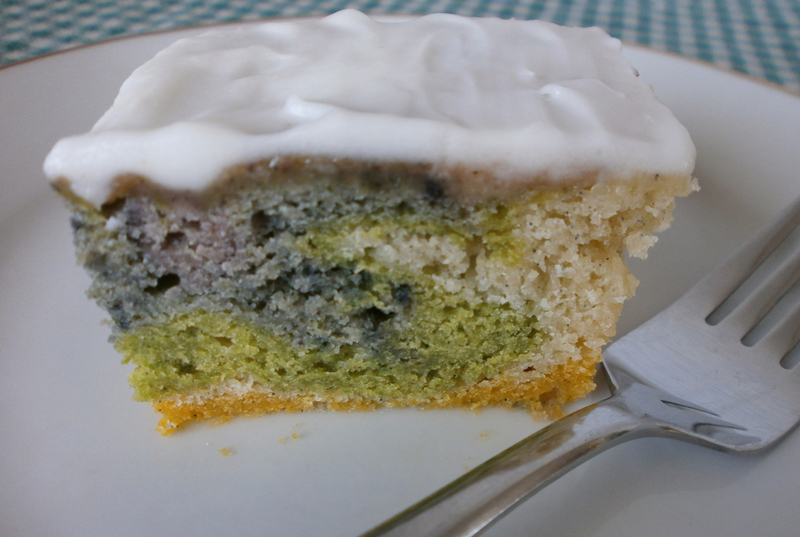 Fun, and I really shy away from artificial colors – you just never know! Thanks for stopping by Throwback Thursday! We can’t wait to see what you’ll have for us next week!